There’s no doubt that we love our pets. Having them by our side just makes life a little bit better. But there’s just one problem — they can stink. Whether they had an accident in the house or had a day of playing in the dirt — our beloved fur babies can make our houses smell not-so-fresh. And pet odor removal doesn’t sound like the most fun task. A smelly house with smelly pets can often be a deterrent to having guests over or maybe you don’t even want to be around it yourself! Luckily, there’s multiple ways to combat the faintest odors to the most powerful. Follow the tips and tricks below and you’ll have a clean, fresh smelling household in no time. Pet odor removal is easier than you think. When pets live in our houses their dander, fur, dirt, and even traces of feces can be brought into the home. The first thing you’ll want to do is start with the basics. Vacuum. Start with vacuuming all surfaces of your home including: floors, carpets, baseboards, rugs, mats, furniture, underneath the furniture, cushions, and especially areas where your pet likes to hang out and spend time. Clean the carpets. After vacuuming your home, it’s best to do a deeper clean to remove odors that have really permeated into your carpets or rugs. There are two ways you can clean your carpets: dry or wet shampoo. Dry shampoo. Sprinkle a powdered carpet cleaner of recently vacuumed carpet. Let the powder sit for about half an hour or as directed on the container. Vacuum once more to remove the cleaner and any dirts or smells from the carpet. Wet shampoo. A wet shampoo will require a carpet cleaning machine which you can rent from many grocery stores. Using a liquid cleaner, you’ll use the machine to run the shampoo throughout the entire carpet. It’s best to let the wet carpet dry for about 24 hours. Once dry, re-vacuum. Spot clean. Any recent messes that are made should be quickly attended to and cleaned using an enzyme cleaner. Enzymes are wonderful at breaking down biological proteins in urine, feces, or vomit. Enzyme cleaners can be bought online or at your local pet store. Clean your furniture. Our pets love to jump up and hang out on our home furnishings. Unfortunately, this a very common place for pet odors to linger. Cleaning your furniture can help rid your home of stinky pet smells. Make sure to check your furniture’s care label to ensure that you’re cleaning it properly — many are dry clean only. Wash your pet. Since your pets are the source of the stink it’s extremely important to bathe them on a regular basis. Make sure you’re using an animal-safe shampoo and be careful to avoid getting water in your pet’s ears. Pay special attention to any areas where they might have gotten into something smelly like their paws or their bottom. Wash your pet’s bed. Your pet’s bed is another main source of pet odor. Many pet beds are machine washable and can easily be thrown into your washer and dryer. Some larger beds have a removable cover on them — wash the cover and sprinkle baking soda on the bed before replacing the cover for odor protection. Wash your bed. 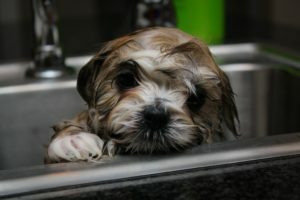 Washing your pet’s bed is a great pet odor removal technique — so it makes sense to clean your bed as well. If your pet is allowed on your bed, you should be washing your bed linens often. Add a quarter cup of vinegar to your wash for extra odor removal. Replace litter boxes. Regularly scooping your litter box will easily prevent nasty pet odors, however, litter boxes will require a deep-cleaning every now and then as well. Empty all the litter from the box and scrub with soap and water. Pour vinegar into the box and let sit for 30 minutes. Scrub and rinse. Once the box is dry, fill with new litter. 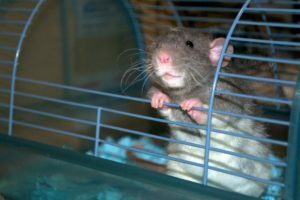 Clean the cage. Whether you own a rabbit, gerbil, ferret or even use a dog crate — cleaning the cage or crate is crucial with pet odor removal. Empty all the contents and scrub the cage with soap and water (or other natural cleaners) and let air dry. Now that you’ve tackled cleaning the sources of the odor, how can you get rid of the lingering smell in the air? There’s a few simple tricks that can help nip that odor in the bud. Let the breeze in. If the weather permits, open all the windows in your home. 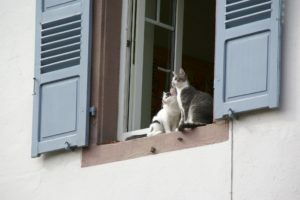 Letting a breeze flow through your home will help encourage the remaining pet odors to leave your house. During the colder months, leave one window open for a few minutes to help encourage air flow within your home. Use an air freshener. There are so many wonderful air freshening products out there that assist with pet odor removal. Products can include sprays, plug-ins, candles and more. Be sure to check the labels and confirm that they are safe for animals to be around or if there are any poisoning risks. Invest in an air purifier. The filters of an air purifier are perfect for trapping dander, fur, allergens, and dust in your home. Air purifiers are essentially making the air cleaner in your home. If you decide to use an air purifier, be diligent on replacing the filters as recommended by the manufacturer. Your house is fresh, clean, and free of pet odors — now how can you keep it that way? With some consistency and routine, you can achieve an odor-free household at all times. Simple actions throughout your day and week are a great way to making pet odor removal problems a thing of the past. Clean up pet messes ASAP. The longer a pet’s mess sits, the harder it is to remove, and the more intensely the odor will seep into your floors, carpet or furniture. As soon as you notice your pet’s mess, clean it up. Pick up the waste, blot the area and clean the area with an enzyme cleaner. Wash toys and pet beds regularly. As mentioned earlier, it’s an important step in pet odor removal to wash all of their toys. But it’s equally important to make this a part of your regular cleaning routine. Try and make it a habit to wash their toys and bedding at least once a week for odor prevention. Stay on top of grooming. Just like cleaning your home and their toys — keeping your pet washed and groomed is crucial in preventing pet odors in your home. Brushing your pet’s teeth a couple to a few times a week is also a great habit to start. Create paw wiping habits. Get in the habit of training your indoor/outdoor animal to stop and have their paws wiped after coming in from outside. This could take some time and patience but it will reduce any substances from outside coming into your home. Keep a towel by your door for easy access. Keep an eye on the litter box. Scooping your litter box every single day should be a requirement in your household for a stink-free home. Do a deeper clean of the litter box every month. Use furniture covers. If you have pets that are allowed on your furniture, it might be wise to cover your couches and chairs in furniture covers. These covers are easy to remove and easy to wash — just throw in the wash when you notice an odor and you’re good to go! Easily washable fabrics like microfiber are also a good choice in a household with pets. Stain removers and odor removers can often be a bit costly to purchase or maybe contain nasty chemicals that aren’t safe for your pet. We’ve compiled 3 cleansers that you can easily make at home. Mix 2 cups of white distilled vinegar with 2 cups of water into a large bowl. Add 4 big tablespoons of baking soda but at them slowly as the mixture will fizz! Pour into a spray bottle and use to treat recent pet messes. You can also choose to leave out the baking soda from the mixture and sprinkle it on the stain directly — followed by spritzing with the vinegar-water mix. Blot and rub until the stain has been removed. Sprinkle a generous amount of baking soda on the stain while mixing together ½ cup of 3% hydrogen peroxide and 1 teaspoon of dish soap. Pour the hydrogen peroxide mixture over the baking soda. Gently scrub the area and let sit for up to 15 minutes. Afterwards, be sure to vacuum the area thoroughly. An enzyme cleanser is a must-have for all pet owners — with a little time, you can make your own! Funnel 7 tablespoons of brown sugar into a container, add 1.5 cups of lemon and orange peels. Next, add a liter of water to the container, screw on the cap and give it a good shake. Undo the cap halfway so it can release the natural gases that will occur. Leave the bottle alone for 3 months and then? You have yourself a natural enzyme cleanser!